The College of Silence is considered by some to be the “black sheep” among bard colleges. Where most bards revel in their ability to retell their stories to a captivated audience, or sing at the top of their lungs, bards of the College of Silence have perfected the ability to tell stories and express themselves while making no sound at all, presenting their words through fluid hand movements and gestures filled with arcane magic. 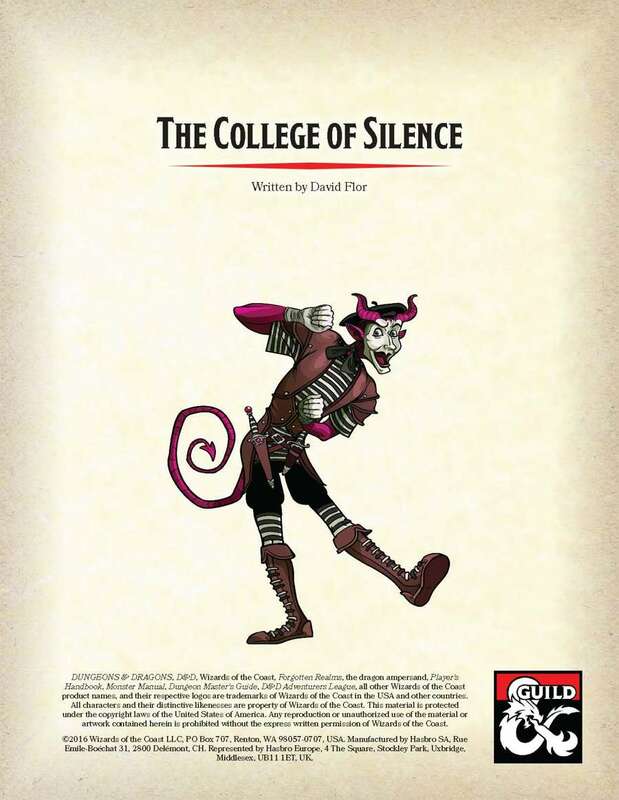 The College of Silence is a bard college compatible with Dungeons and Dragons 5th Edition. saw a writeup on this I THINK. It’s because it’s a 2 page document, they can’t give a preview or there would be no reason to buy... I get it, but I need more info to make a decision too. It’s a shame.. I sprang for it out of curiosity, and I think it is a pretty interesting take, whether or not you'd want to be the one playing the mime. If my teasers convince you to buy it, you could let the author know, and maybe they can spill a little more about it in the description.